Rapid Transfer is a method of depositing and withdrawing money that was created in 2008 by the online casino Bodog. It is essentially a renamed version of Money Transfer using Money Gram. There are two methods to initiate a deposit or withdrawal with Bodog using their Rapid Transfer system. Firstly, a user can call Bodog’s customer services and they can initiate the transfer for the user. Bodog will then direct you to your nearest Money Gram agent. You will be required to visit the location of this agent and choose to pay them in cash or via credit card. 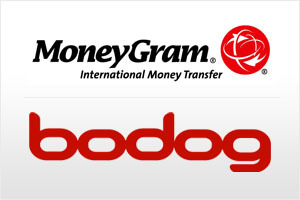 Once the money is handed over to Money Gram it will be transferred to your account on the Bodog website within a matter of days. Alternatively, this process can be achieved without needing to call the Bodog customer services. A customer can go to a Money Gram branch and fill out the details of the payment and online casino information. Once this is completed the customer will be given a reference number which will have to be entered by the casino in order to receive the deposit. Essentially, the same method applies to withdrawals as well. All that a Bodog account holder needs to do is request a withdrawal and Bodog will send the funds to the nearest Money Gram office for the user to collect. Rapid transfer is free when a deposit of over $200 is made and the maximum anybody can deposit in one day is $2500 (with the minimum being $100). Withdrawals can be made up to $2000 per day. For American customers, there is a distinct advantage to Rapid Transfer when depositing cash-only amounts under $900; there will be no transaction record to an online casino.